When purchasing a brand new hand electric polisher, there are several issues you may want to consider. Will this tool have enough power to polish granite or drill a hole into concrete? Is the tool light enough to use for an extended period without tiring you out? How will be the durability? You may also want to know how much it vibrates. A heavy tool that vibrates excessively is certainly not ideal, especially if you plan to use it for several hours. What about the availability of parts? Most electric polishers contain components that can be replaced over time, but some manufacturers do not offer spare parts. How inconvenient! We believe that when you purchase an electric polisher, you should be able to use it for many years to come. Our best selling electric polisher, the AWP-216/214 is the solution to all these problems. It has plenty of power and detachable tools to manage all types of stones as well as concrete and glass. It weighs just about 6Lbs, which we can assure you is not too heavy for even the longest job. To ensure the long life of your electric polisher, we stock spare parts, so if you should ever need to replace one, you can do so without a problem. Surprisingly, some manufacturers do not have offer spare parts, so if something goes wrong with your electric polisher, you have no option but to purchase a new one. 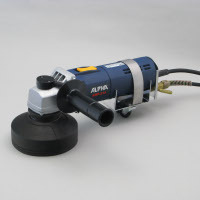 The AWP-216/214 electric polisher is a tool designed for wet polishing, profiling, core drilling, and light grinding applications both in the shop and at the job site. Equipped with exchangeable casters, it can be used on staircases as well as at corners and in small spaces where a standard floor polisher cannot go. The AWP-216/214 electric polisher can be used for stone polishing (polishing and chamfering) and can be equipped with flexible diamond pads as well as diamond chamfering tools. The flexible diamond pad can be attached with a Velcro holder onto either an M14 or M16 spindle. The AWP-216 has an M16 spindle and the AWP-214 has an M14 spindle. The AWP-216/214 is equipped with a convenient central water feed system that includes a water valve, hose and garden hose/faucet adapter, flexible rubber splash guard, and either a C-handle or a regular side handle. A caster assembly is also included to provide stability while polishing flat surfaces. For safety, the AWP-216/214 is double insulated and is equipped with an in-line GFSI (Ground Fault Circuit Interrupter). Only a C-type wall plug is provided. As a further convenience, this electric polisher is shipped in its own carrying case for easy portability and storage. All this in one tool will make the AWP-216/214 the only electric polisher you will ever need. Our tools can be used for granite, marble, tiles, and other natural stones such as limestone, sandstone and travertine. They are also well suited to the processing of engineering stones (Techno stone, Breton stone, Sile stone, Caesar stone, etc.). Our handy polisher (polishing machine) is designed to be compatible with variety of attachments: Diamond tool can be directly attached to the spindle, though these tools cannot be quickly attach and removed. The bottom part of this joint is threaded (M16 or M14), while at the top is a special holder to which you can attach rubber pads or rigid pads. This special holder can be attached and removed very easily and is exclusively available from us. This joint is threaded at one end (M16 or M14), and has a special holder at the other end, where you can attach our diamond tool (only Twincur, see other pages/Diamond Tools category). This attachment is exclusively available from us. 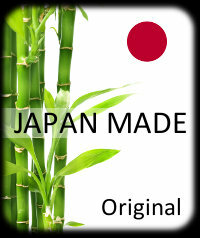 With various joint, we also have wide variety of tools for all sort of work materials.